For those not in the know, "Southern Cross" is Howard Rice's customised SCAMP, built specifically for a voyage of exploration along the southern coast of Chile from Punta Arenas in the Straights of Magellan out into the southern ocean and south toward Cape Horn. Howard has been preparing for this voyage for some years now, and its going to happen this southern summer. Please note, we have a very generous donor who will donate a dollar for every dollar we raise toward the video production, if you'd like to see the movie please consider putting in a few bucks to help us get it filmed and produced. Every dollar you put in, with our donor helping, becomes two dollars. I went to Chile with Howard back in March to check out facilities and what we had to work with in Chile, had a great time and got a lot of background material videoed. We have a base, a place to stay, made contact with the Armada de Chile who were very helpful, and David Nicholls of Lutra Productions and I are very much looking forward to being there when Howard sets sail. A piece at a time. Building yourself a boat is not so much a huge job, as a whole lot of small jobs. So I've done a few of those over the past week and the project is looking better all the time. Started the epoxy coating this week, I’d coated the inside of all the parts of the main mast step box, had some epoxy left over so pumped another two pumps of epoxy into the container, mixed it up and used that to put a coat on most of the area around the stem and frame one. I’d prefer to use paint but that would mean I couldn’t glue to it, so for that area its easier to epoxy it with a section of paint roller on a stick. 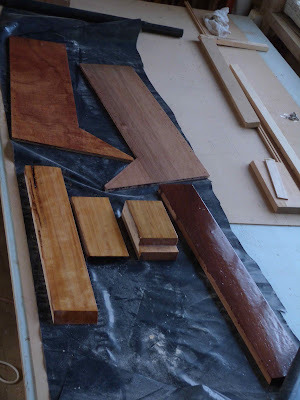 The parts for the mainmast box, the sides are 9mm plywood. Once assembled this area will be very difficult to access for repainting so I"m making a good job of the coating. Three coats of epoxy, and that will be sanded and painted with two part polyurethane paving paint which is very resistant to both abrasion and UV so should last well. Made up the components for the mast boxes for both the main and the mizzen this week. 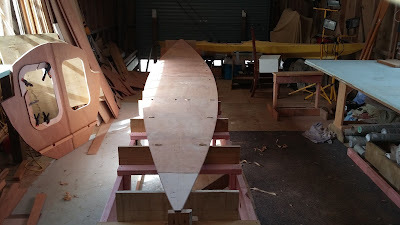 As I’m planning to have some carbon fibre tubes made up for mast and spars, rather than the full depth ramp for the heavier wooden mast the one for the main has the “SCAMP” type ramp to help me get it in there and up, and its that step and box that needs to be set in place first. The stringers that run alongside it at deck/cabin top level also brace B#3 and B#4 , and they cant be put in until the mast box is in place. A good fit is needed here plus they’re screwed from inside the mast box. I had a visit from Callum, one of the students from my last boatbuilding skills course, I’d offered to run some wood into stringers and such on my sawbench, the Pelegrin that he’s building takes around 120 metres of 20 x 25 for its stringers, a bit more here and there for other parts, and ripping all that with a skilsaw would be labourious in the extreme. He’s good company and we had a pleasant chat after the job was done, and I was hugely pleased to find out that a neighbour of his had a heap of Kauri for sale. Her late husband had collected it, and she was looking to sell it all off. I bought some off Callums trailer, and will be going over there in a couple of weeks to check out the rest, thanks Callum. That’s saved me having to go shopping at the expensive lumber place. I’ve fitted up the seat front on the port side, that’s stiffened up the structure a lot and I’ll be making the pattern for the seat top next. There were two full plywood sheet length pieces 400mm wide left over from scarfing up the bottom panel, and I’m hoping that they’ll be deep enough to be the offcentercase sides. If not, the rowing seat support stringer will be used as a doubler so I can add whatever extra is needed to the top edge. The ‘case cant go in until I have the stringers and lowest plank on but in the meantime I can make it up, plus the ‘board and its pivot. ( PS. I think that they'll need about 40mm added. No problem, thats easy). The cockpit on Long Steps is 3.2m long (almost 11 ft). Thats including the area under the cuddy roof and the area aft of the raised cockpit floor. 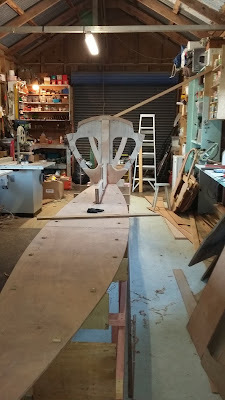 Aft of that is an area with no seats, just floorboards under which acts as a drain well for the bilge pumps and venturi, its where my bean bag will go and gives me a place to stand when sailing to rest my behind from sitting on plywood seats. The ballast tank forward end is at the bulkhead nearest you, the one in the middle is a support, and the one at the after end is the next one. About 120 litres of water, thats close to 250 lbs of ballast which should help her stand up and go in a breeze. 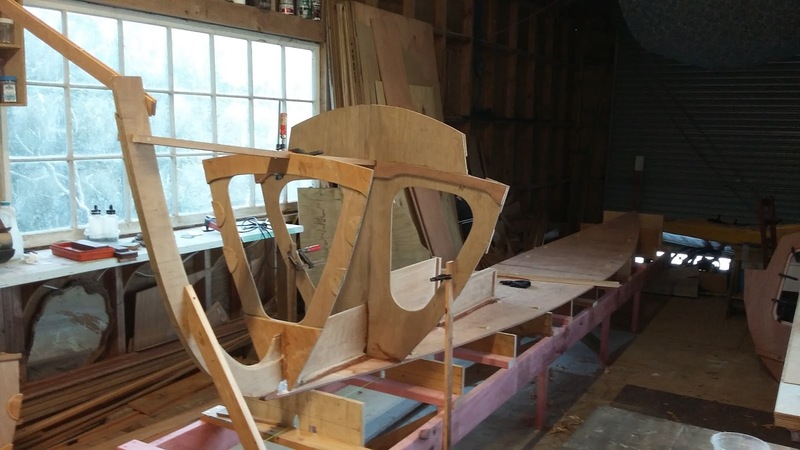 I want to use the seat tops to brace B#4 through to B#7 so they wont move when the stringers are being wrapped around, and its much easier to fit them now than when the hull is further along. Another little job to do. I'll be building a battery box in here, it needs to be such that the weight of the battery will be carried by the bulkheads rather than the bottom panels as bumping along the road on the trailer with that weight sitting on 9mm plywood wouldn't be good. Its late afternoon now. My little dog cant speak, apart from describing the outer covering on trees (Bark) and the drink made from grapes (Whine) but he can communicate very well and he’s telling me its past time he took me for a walk. If I don’t go he’ll "growl" at me. Can't have that! Long Steps is taking shape, all the frames are up. Slow progress, but progress nevertheless. I’ve altered a couple of things, so had to remake one frame. But that’s done now, and I’ve all of them stood up, glued and screwed to the bottom panel, and the interesection between the two filleted. Note that I mask the fillets with plastic paint masking tape, the ones that will be seen anyway. It makes getting a tidy job much easier. I peel the tape off as soon as I’ve got the fillet properly formed, otherwise when the epoxy sets its very hard to remove. Note too that in order to make them easy to sand but still structurally sound for a high strength application I sometimes do the fillet in two shots. One with thickened glue using an 8mm radius tool for strength, then when its tack free but still green I’ll run a fillet of low density filler such as microballoons in epoxy over that with a larger radius tool. That makes it easy to sand and it looks nice. Back to the boatbuilding. With all the frames up its evident to those with an educated eye that she’s pinched amidships in the top two planks, that’s to keep the beam down a little where the oars will be, Shes about three inches narrower there than she would otherwise be, and that translates into oars that are about 5in shorter, an important issue when trying to stow them in the boat. Why not just make the boat more slender? Loss of sail carrying power, she’s relatively narrow on the waterline so she’ll row, but wider just above there so when she heels she picks up stability very quickly. I need all of the stability at 12 to 15 deg of heel that I can get but still keep those oarlocks at a reasonable distance apart. Its all about how to work the compromises. Filleting to go in yet but the structure is beginning to look vaguely boat shaped. There is more room in the "cuddy locker" and in the Cuddy than in a SCAMP, and the cockpit is a good metre longer, has the last metre or so as a stand up place . She feels BIG right now, the last several boats I've built have been much smaller. I'm enjoying the work! 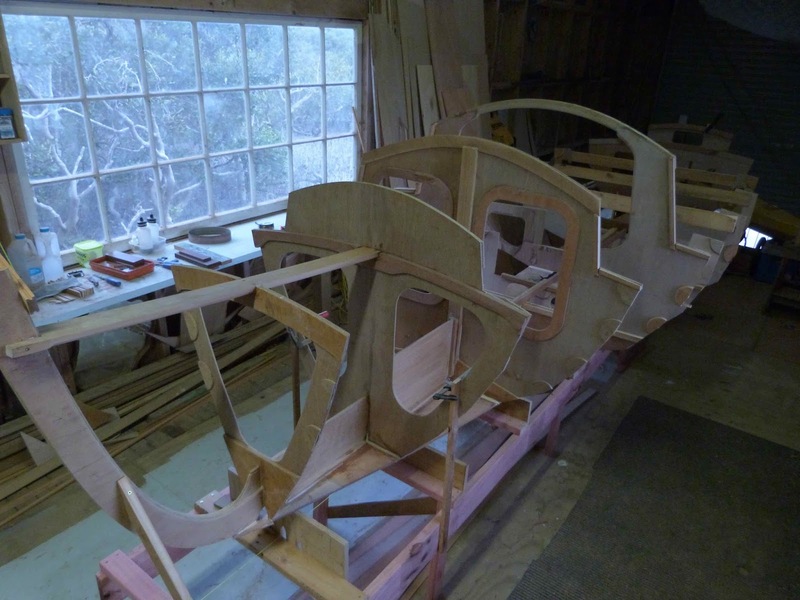 The next job will be to start putting in some of the lengthwise pieces, the corner stringers between the seat fronts and seat tops, they’ll act as some of the bracing needed to hold everything in place while I wrap the stringers around. While working on that I”ll be putting some extra pieces in to spread the load from the big fairlead ( Chock) on the foredeck, the mooring line, sea anchor and anchor lines all go through that and it’s a highly stressed item so there will be extra bracing under the foredeck king plank to take that. On Monday I’ll be off to the place that has expensive pieces of wood to buy some Western Red Cedar which I’ll rip up for stringers. Some of those need to be over 20 ft long so I’ll buy the wood at about 12 ft, rip it to size then scarf it to get the lengths needed. Four stringers 20mm x 30mm each side, plus the inwale, that’s the one along the inside edge of the side deck and cuddy and supports the foredeck as well. That’s ten scarf joints to make. The outer, or rubbing strake will go on much much later. I’m only getting a couple of hours a day, and that not every day so I plan my work around the time available, that sometimes means that should I get more time, I’m still waiting for glue to set so can't do much. When that happened on Thursday last I decided to occupy myself by sharpening a couple of planes and make a start on rehabilitating some beaten up Marples Chisels I got very cheaply off TradeMe. But sometimes patience, or tolerance wears thin. 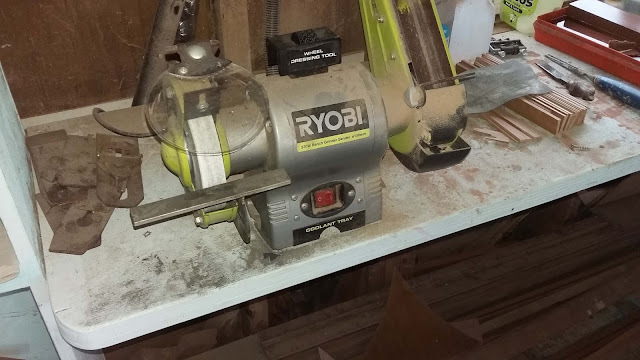 The toolrest on my Ryobi grinder and linisher was a dreadful thing, too short, too flimsy, interfered with the hands as the tool was run back and forth over the grinding wheel and, well, it was a pain in the very low back to use. So, out came the engineering tools, hacksaw, files, drill, taps and such, and I’ve made a nice toolrest from a 6in long piece of 1in x 3/16in mild steel, drilled and threaded, cap screwed to the highly modified old toolrest, and beaten into parallel and square with a few whacks of the middle sized hammer. I didn’t get the tools sharpened, but did get one of the things that was annoying me out of my life. Priceless! I should do that more often. Its late, I’ve been otherwise occupied for a couple of days, so the blog has had to wait. So heres’s a little thing to keep you occupied until I can get into the shed when there is light enough for a progress pic or two of Long Steps. This is Gary Blankenship behind the camera, and his skipper Chuck Leinweber in the stretch Walkabout that Chuck built and Sandra, in her immediately recognisable style, painted. The event is the Everglades Challenge back in 2013, that’s a 300 mile race down the western side of the Florida peninsula then across the bottom to Key Largo. It’s a challenging event, four or five days for most participants and that’s if everything goes well. It looks as though the guys had a memorable trip this time. Thanks Gary for the video, and thanks Chuck for the moments of mirth. Here's more about the boat. I cant get the link to work so, please, if you'd like to read more, cut and paste that into your browser. Thanks. Here's more about the boat. Long Steps stem and frames are being stood up, the shape is starting to be evident. The shape is beginning to appear! So far the shape that was in my minds eye, developed by appplication of theory of hydrodynamics and such, modified by analysis of stress paths and loadings was not visible to anyone other than myself. The drawings say some of it, but its not the same as standing alongside the real thing. But today, I’ve the building frame there, all straight and square thanks to the laser level, the bottom panel scarfed up and cut to shape and fastened down in its gentle fore and aft curve. The stem and the spine that runs back to B#4 is glued and screwed down and the bulkheads / frames are slotting over it. To my prejudiced eye the shape of the boat is beginning to emerge, I can see in my mind the continuation of the sheer line, I can feel the space inside under the foredeck and in the big cabin/locker and am very much looking forward to getting the next bulkhead up so I can get in there and sit under where the cuddy roof will be. 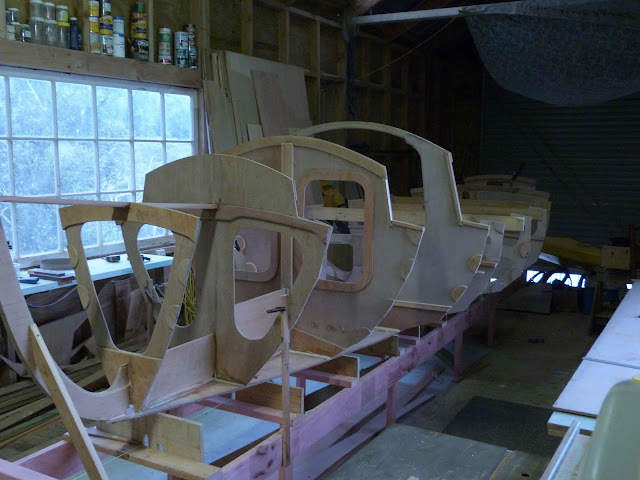 It’s the same as the builder who, once the shell of the boat is done, sits in there holding a broom handle over the transom with a faraway look on their face. I’m the same, the imagination keeps the dream alive and the motivation going. B#1 and B#2 in place. Note how they’re braced, the assembly has to be really rigid as there will be some real stress on them when the stringers are wrapped around. When installing them I’ve checked for square across and vertical, level across, and braced the stem and B#2, then used the foredeck king plank to locate B#1. 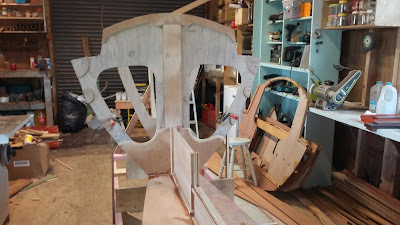 In the next few days there I’ll be fitting the hatch opening doublers to the starboard hatch opening on B#3, routing the groove for the sealing gasket, and mounting that and B#4 on the frame. 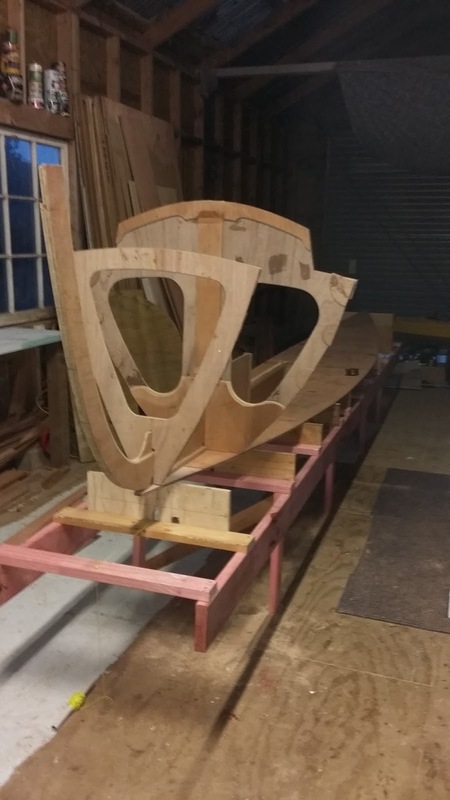 B#5, B#6 and 7 will go in next, the starboard side in the seat front area will later on be cut away to take the “offcenterboard case” but for now the priority is to get all of the framing done, the lowest and highest stringers in, and get it all fair. 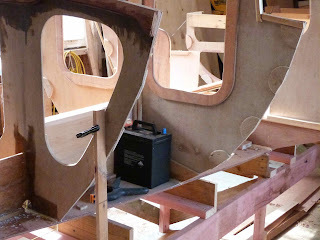 This is the fun part of the build, watching the boat take shape. View from the bow, just the bottom panel screwed down to the building frame. Thats B#3 on the left with part of the hatch opening doublers ready to be glued up. Yes the shop is a bit untidy, there is usually a cleanup every night before lockup, but I missed last nights sweep and put away, so its double penance tonight. 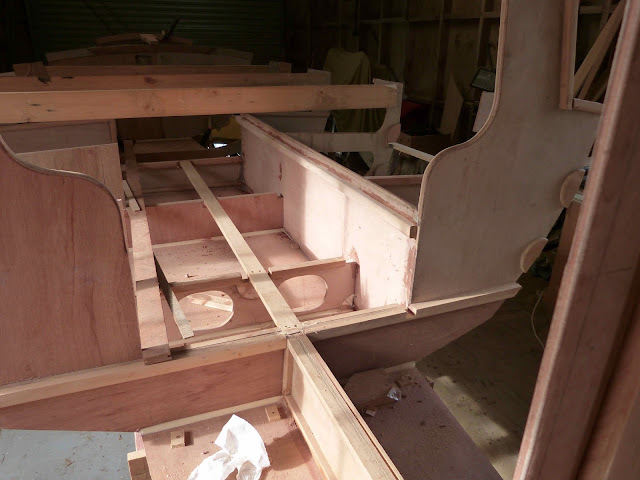 From the stern end with the stem and spine, B#1 and B#2 in place, glue still to come. Closer view, thats B#4 on the right with 5, 6 and 7 stacked behind it. The vertical strip on the back of B#2 is part of the mainmast box which steps on top of that deep web in the spine. The little semicircles on the edges of the frame are stringer intersection doublers which make it easier to put screws through the stringers and into the edges of the frames. View from forward. There will be more bracing put on as I progress aft erecting frames, in the meantime B#1 is held in position by being slotted over the spine and having the foredeck king plank laid in its cutouts. The light coming in under the door in the end of the shed is, by the way, a reflection from the water in the river. To launch this boat when finished I'll be able to just open the door and slide her out. I was very lucky to find this place. Dry fit before gluing up, they needed to be braced, leveled and squared but it was so exciting to see that I just had to get the camera out.